A blog on the modern dog – by Dr Rowena. Until recently animals survived only when they were adapted to their environment. Where there was snow and ice, a species survived if it adapted to the cold. Think furry coats, small ears and thick layers of subcutaneous fat. The same species might also flourish in a hot environment, but only if there was enough variation within the species to allow for a short coat, bigger ears and less body fat. Form had to follow function, and only the fit survived. It is arguable that the modern dog is more variable in size, shape and behavior than any other living mammal. Exactly where the genetic divergence of dog and wolf took place remains controversial, but there is general agreement that dogs were first domesticated about 14,000 to 17,000 years ago. Domestication brought a change in selection pressures. By rewarding features such as a louder bark or a docile temperament with more food and shelter, and the opportunity to bred, ancient humans were tinkering with the selection of dog genes. But ancient humans were as much affected by their environment as their domesticated dogs, and the selection pressures they brought to bear still reflected a need to function successfully within their environment – to be able to run, hunt and scent. Intensification of this selection and the rise of registered dog breeds has occurred within the last few centuries, and it is not a coincidence that this change in many ways parallels the Industrial Revolution Timeline. As humans became removed from environmental selection pressures so too did their pets. Without the need for function to dictate form, new selection pressures arose. The dog with the fiercest bark, the fastest legs or the best nose was no longer most desirable. Opposite and wholly incompatible breed standards arose and features previously eliminated from the gene pool began to be preserved and promoted. The variability in form that allowed dogs to thrive in environmental extremes has become the source of great suffering for many individuals. Take, for example, the pug. With a short nose, snuffling breathing, huge eyes and rolling gait, the pug is one of the most distinctive and easily recognisable breeds. There can be no doubt of the pug’s visual appeal, but the price of such beauty is harder to see. Pugs, along with French bulldogs and British bulldogs, belong to a group of brachycephalic (short headed) dogs. Other members of the group include Boston terriers, Shih Tzus, boxers, King Charles spaniels and Pekingese. All have comparatively wide skulls, large eyes, short noses, narrow airways and big bodies – sometimes on relatively short legs. The more extreme (think the pug) the modification, the more likely the problem. Short muzzles and flat faces don’t leave much room for the essentials. Brachycephalic’ rarely have nostrils wide enough for breathing or mouths big enough to accommodate regular sized tongues. Apart from constant snuffling, snorting and snoring some of these animals will collapse from lack of oxygen if excited to anything beyond a walk. Which rules out any chance of running, hunting or scenting game. But even if they could breath easily, the smaller of members of the group face other problems. Those gloriously large eyes are often too large for the shallow sockets they rest within. A short, squashy face means short, squashy eye sockets from which the eyeballs are easily dislodged (proptosed). Sometimes it seems as though these eyeballs don’t even need an overzealous hug before descending from their shallow sockets. And then there are the skin folds. Shortening the face folds the nose back, which folds the skin, and the wrinkled skin then comes to rest in folds over the nose and under the eyes, trapping heat and moisture and pushing spikey fur up against the delicate surface of the eyeball. These skin folds leave trails of damp, discoloured fur and lead to bacterial infection (pyoderma). Surgical removal of the skin fold to reduce infection and prevent corneal damage is not uncommon. 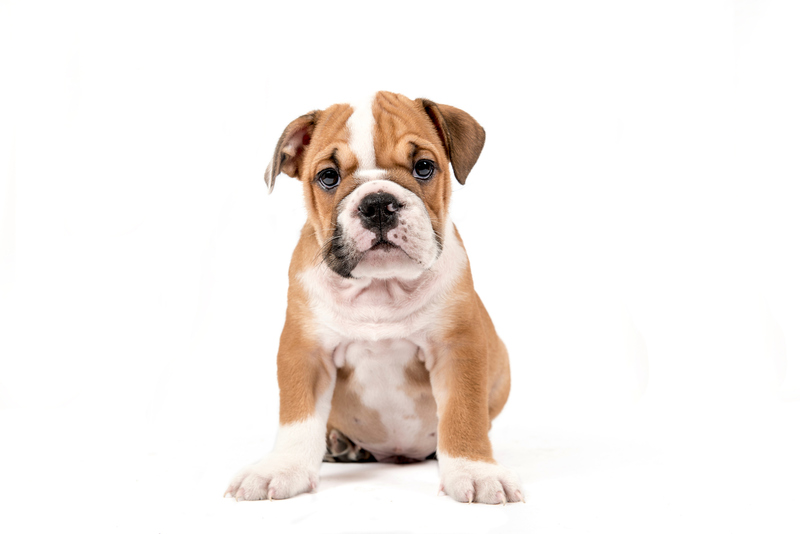 Dental disease, excessive tongue tissue, collapsing airways – these are all over represented in brachycephalic dogs. Big heads, broad heads, and the stocky necks and wide shoulders required to support such skulls can lead to birthing problems (dystocia). The combination of large forequarters and small pelvises seen in British and French bulldogs results in a disproportionate number of assisted births – usually caesarians. And the list goes on. Each change away from the tried and tested shape of the wolf, where all parts must work together to improve the function of the whole, is likely to suboptimise the life experience of the individual. Significantly smaller individuals suffer from bones that are not properly built to support movement, vertebrae that fail to stabilise the spine, hip sockets that can not shelter the femoral head. The RSPCA and the Australian Veterinary Association have launched Love is Blind, a campaign for urgent changes in breed standards, recognising that the exaggerated features of some breeds come at a high physical, emotional and financial cost. Breeders are encouraged to become advocates for the health and welfare of the breeds they profit from, and to actively prevent these problems by selecting to breed from individuals with more normal and moderate appearance. Kennels councils and judges can create change by rewarding for health as a priority in the show ring. If you are considering purchasing a puppy, consider not only what type of dog will suit your yard and your lifestyle, but what type of dog is likely to have the features necessary for a happy, healthy life. Ask to look at the parents and then consider whether the adult dog looks as though he or she could cover a brisk lap of the dog park without distress or respiratory compromise. Well set eyes, a snout that could retrieve a tennis ball, legs that are in proportion to the body and sit under the body to more evenly support its weight. When we see form as the basis for function, we will again select for features that allow those we love to live healthy, happy lives.